Background: Gentamicin (GM) nephrotoxicity accounts for 10-30% of the acute renal failure (ARF) among drug-induced ARF. In Ayurveda such side effects are considered as the poisonous effects of low potent poisons called gara viṣa. Bilvādi agada (BA), a classical formulation is indicated in gara viṣa and most of its ingredients have proven for their nephroprotective activity. 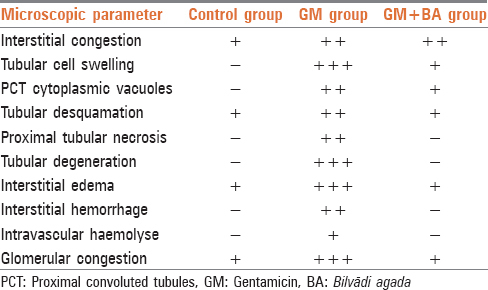 Aim: The aim was to evaluate the effect of BA in GM-induced nephrotoxicity in male Wistar rats. Materials and Methods: BA, GM, normal saline were procured from standard companies. Settings and Designs: Eighteen male Wistar rats were randomly divided into three groups, viz. Control group which received normal saline intraperitoneal (i.p.) daily for 8 days; toxic group received GM 80 mg/kg/day i.p. for 8 days, and trial group received both GM 80 mg/kg/day i.p. and BA 216 mg/each rat weighing ~200 g orally 1 h after administration of GM. Statistics: All the values were expressed as mean ± standard error and data were analyzed by applying one-way analysis of variance followed by Dunnett's test for multiple comparison. Results: BA treated group showed a significant change (P < 0.05) in levels of serum creatinine, urine creatinine, and urine potassium. There was no significant change (P > 0.05) seen in serum potassium, sodium, chloride, calcium and phosphorus and urine sodium, chloride in all three groups. Glomerular congestion, interstitial edema, tubular necrosis, interstitial hemorrhage was reduced in BA treated group. The results of this study indicate that BA reduces GM-induced nephrotoxicity and it may be due to anti-inflammatory, immunomodulatory, diuretic and anti-oxidant properties of drugs. Further studies are necessary to explore the exact mechanism of BA in nephroprotection. Kidneys are the major excretory organs which remove metabolic wastes through urine. Humans are exposed routinely to a variety of diverse chemicals that harm the kidneys . Medications, natural products, industrial chemicals, environmental pollutants, pesticides, etc., cause damage to different organs of the body at various levels. Bilvādi agada (BA) is an antivenom formulation indicated in the context of snake venom management. It is also indicated in low potent poisons. It contains Aegle marmelos Linn., Ocimum sanctum Linn., Pongamia pinnata Linn., Valeriana wallichi DC, Cedrus deodara Roxb., Phyllanthus emblica Linn., Terminalia chebula Retz, Terminalia bellirica (Gaertn.) Roxb, Zinziber officinale Rosc., Piper nigrum Linn., Piper longum Linn., Curcuma longa Linn., Berberis aristata DC. and goat's urine. Therefore, the present experimental study was conducted to evaluate the nephroprotective activity of BA in GM induced nephrotoxicity animal model. Eighteen healthy male Wistar rats were procured from licensed breeders (Venkateswara Pvt. Ltd., Bangalore) weighing 200 g (±20 g) and were 8-12 weeks of age. The animal experiment was approved by the Animal Ethics Committee of the institute. Animals were housed in stainless steel cages under standard laboratory conditions at ambient temperature 22 ± 3°C and 45-55% relative humidity with 12 h natural light/dark cycle. Committee for the Purpose of Control and Supervision of Experiments on Animals guidelines were followed throughout the study. The animals were provided ad libitum with tap water and fed with standard diet (Amruta feeds, VRK's Scientist's Choice Laboratory Animal Feed, Baramati). Eighteen rats were randomly assigned to three groups equally. GM + BA treated group, injected i.p. GM (80 mg/kg) along with oral administration of BA 216 mg/each rat weighing ~200 g for 8 days. Rat dose = Human dose in grams × surface area of Wistar strain rats in square meter. Assessment parameters - Biochemical tests - Animals were anaesthetized by light ether anesthesia and blood was drawn through cardiac puncture and collected in labeled plain vials. Animals were put in metabolic cages on 8 th day and urine was collected on 9 th day. Blood urea nitrogen (BUN), serum creatinine, serum electrolytes - Potassium, sodium, chlorine, phosphorus, calcium, urine creatinine, urine electrolytes - Potassium, sodium, chlorine were assessed as markers of toxicity. Kidneys were collected immediately after sacrificing and transferred to 10% formalin solution in separate labeled containers. Blood, urine, and kidney samples were sent to Jeevan Diagnostic Center, Belgaum for biochemical investigations and histopathological study. All the values were expressed as mean ± standard error and data were analyzed by applying one-way analysis of variance followed by the Dunnett's test for multiple comparisons using SPSS software version 21.0 (IBM corporation). P < 0.05 was considered as statistically significant. Gentamicin produced significant changes in the levels of serum creatinine, urine creatinine, urine potassium, urine chloride, urine sodium, and BUN when compared to control group indicating GM induced toxicity. Whereas BA treated group produced significant changes only in the levels of serum creatinine, urine creatinine, and urine potassium showing protective effect of the drug on these parameters. There were no significant changes in the levels of serum potassium, sodium, chloride, calcium, and phosphorus in all the three groups [Table 1] and [Table 2]. All parts of kidney showed normal appearance in control group except for mild congestion. Treatment with GM caused acute renal damages which were evident by marked glomerular congestion, interstitial edema, tubular necrosis, and interstitial hemorrhage [Figure 1]. These changes were again reduced in BA treated group which were evident by mild congestion and prevention of tubular degeneration, interstitial edema showing protective effect of drug [Table 3]. Renal failure denotes failure of the excretory function of kidney, leading to the retention of nitrogenous waste products of metabolism in blood, failure of regulation of fluid, and electrolyte balance along with endocrine dysfunction. This happens only when the damage exceeds 25% of normally functioning nephrons. It occurs due to exogenous agents and endogenous agents like radiocontrast agents, cyclosporins, antibiotics like aminoglycosides, chemotherapeutic agents, organic solvents, acetaminophen, and illegal abortifacients. Kidneys becomes one of the important targets for toxicity more than any other organ of the body due to high levels of toxins being delivered to the kidney due to the higher blood supply. GM, an aminoglycoside antibiotic has nephrotoxicity as a common side effect. Bilvādi agada as a whole formulation might have worked in the kidney on various levels. Along with glomerular filtrates, the active principles of BA might have passed into the interior of nephron, and bound with receptors located at proximal convoluted tubules. Thus BA might have bound with the GM molecules and prevented renal damage. For detoxification process and enzymatic activity, cells need to maintain alkalinity at intralysosomal level. BA might have maintained alkalinity at tubular levels which was raised by GM above the effective range of enzyme. Thus, BA might be preventing the consequences of nephrotoxicity induced by GM. On the basis of results obtained from the blood and urine analysis, histopathological reports showing comparison of three groups it can also be postulated that, BA inhibits accumulation of GM in lysosomes and thus prevents phospholipidosis and renal damage. Furthermore it can also postulate that, BA enhances renal cortical mitochondrial oxidative phosphorylation which is evident by lesser proximal cellular damages in the kidneys of GM and BA treated group. Thus, BA might also help in repairing the tubular damage. Bilvādi agada treated group showed a significant decrease in serum creatinine and helped in the disposal of creatinine through urine indicating a protective effect of the trial drug. Hyperkalemia produced due to GM was normalized in BA treated group substantiating its protective effect and was statistically significant. Here BA might have either bound with the GM molecules and prevented renal damage or might have repaired the damaged tissues. Bilvādi agada has shown nephroprotective activity based on biochemical changes observed in Serum creatinine, Urine creatinine and potassium levels and this may be due to anti-inflammatory, diuretic, immunomodulatory, and anti-oxidant properties of drugs in BA. Histological studies also confirm its protection. Further human studies are needed to prove the efficacy of the BA as potential nephroprotective drug in clinical practice. Ali BH. 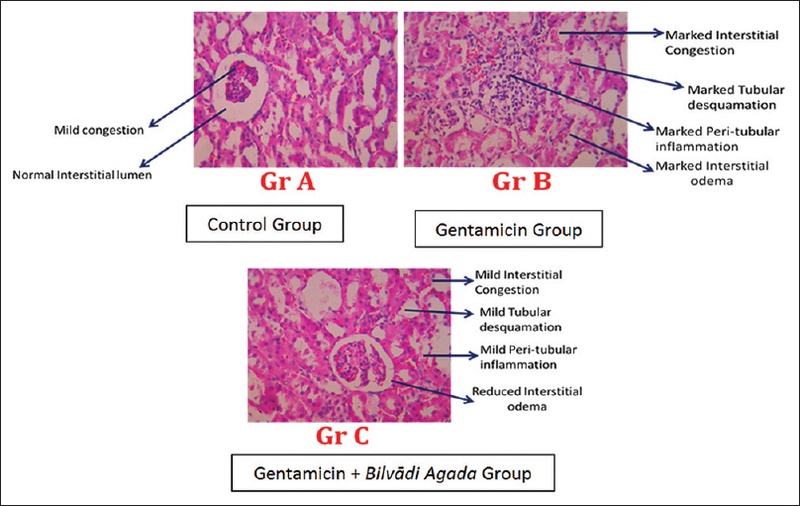 Agents ameliorating or augmenting experimental gentamicin nephrotoxicity. Some recent research. Food Chem Toxicol 2003;41:1447-52. Navre KR, Kunte AM, Vaidya HP. Ashtanga Hrudayam. Reprint. Uttarsthana 35/49. Varanasi: Krishnadas Academy; 2000. p. 578. Gupta AV, Upadhyaya Y, editors. Ashtanga Hridaya. Uttarsthana 36/84,85. Varanasi: Chaukhambha Sanskrit Sansthan; 2005. p. 585. Pydi R, Rajalakshmi I, Indumathy S, Kavimani S. Nephroprotective medicinal plants - A review. Int J Univ Pharm Life Sci 2011;1:266-81. Ghosh MN. Fundamentals of Experimental Pharmacology. 3 rd ed. Kolkatta: Hilton and Co.; 2005. p. 192. Guyton AC, Hall JE. Text Book of Medical Physiology. 9 th ed., Ch. 31. Unit V. Bangalore: Prism Books (Pvt) Ltd.; 1996. p. 411. Robbins KC. Basic Pathology. 6 th ed., Ch. 14. Unit 2. Saunders: Harcourt Asia Publication; 2002. p. 459. Available from: http://www.ncbi.nlm.nih.gov/pmc/articles/PMC3153700/. [Last accessed on 2012 Dec 21]. Available from: http://www.ncbi.nlm.nih.gov/pubmed/22819561. [Last accessed on 2012 Dec 21]. Sharma PC, Yelne MB, Dennis TJ. Data Base on Medicinal Plants Used in Ayurveda. Vol. II. New Delhi: Central Council for Research in Ayurveda and Siddha; 2002. p. 292. Noorafshan A, Ashkani-Esfahani S. A review of therapeutic effects of curcumin. Curr Pharm Des 2013;19:2032-46. Jadon A, Bhadauria M, Shukla S. Protective effect of Terminalia belerica Roxb. and gallic acid against carbon tetrachloride induced damage in albino rats. J Ethnopharmacol 2007;109:214-8.